Does Medicare Cover Acupuncture or Chiropractic Care? Often times, in the weeks following an injury or when pain becomes too much to deal with, patients will seek the support of a chiropractor, or acupuncture specialist. Both acupuncture and chiropractic care were created to treat moderate to high-level pain and discomfort. However, one concern that always comes to mind is out-of-pocket expenses, which can definitely add up. So naturally, this has Medicare beneficiaries wondering just how much of these treatment costs are covered by their Medicare plan, if covered at all. Like stated above, both of these methods of treatment were created to relieve pain or discomfort. Before looking into the cost difference between the two, you may consider what each form of treatment entails. It is best to look further into both before deciding on the best option for you. A rule of thumb is Medicare will cover anything that’s considered medically necessary. At this time, acupuncture specifically is not covered by your Original Medicare plan. Medicare does not cover services that are not considered medically necessary. Medicare will cover other types of therapy, like physical, occupational, or speech therapy. However, acupuncture is not part of those types of therapy yet. Anything considered medically necessary is covered by Medicare. Unfortunately, Acupuncture does not fall into that category. Unlike chiropractic care, acupuncture is not as much of a hands-on method for reducing pain. Acupuncture is done by inserting needles into the surface of the skin. This is a practice that will stimulate certain parts of the body to alleviate pain, and can also help to treat several other medical health conditions. In fact, several acupuncture patients have reported that this treatment has helped cure their depression, anxiety, and several other mental and physical issues. Again, like chiropractic care, acupuncture does come with some low risks. Acupuncture risks can include bleeding or bruising from the needles, infection, and in some cases can stimulate labor for pregnant women. If you are considering acupuncture treatment, just be sure you choose a licensed practitioner. It is important to note that, while both are proven effective and useful options, there are differences in what Medicare plans will cover. Chiropractic care is a very hands-on process. For chiropractic treatments, the physician uses his or her hands to adjust the patients’ muscles and joints. This is done to generate better movement to tight muscles and gain better usage of affected joints. Neck pain, back pain, headaches, or anything that may cause a disruption in the nervous system, are usually a common reason patients seek chiropractic care. Patients who receive this form of treatment typically feel results immediately after leaving the appointment. However, chiropractic care does come with a few possible risks. Amongst them, are risks of having a stroke or unintentionally adding pressure to the injury. The risk is low with certified practitioners, but with the constant shifting of muscles and joints, you could possibly end up being more susceptible to injury. Yes, Medicare covers chiropractic services, if they are medically necessary. Luckily, Medicare currently has no cap on how many times you can see a physician for necessary chiropractic appointments. If you are enrolled in Medicare Part B, 80% of the cost for chiropractic care will be covered by Medicare. If you have the Original Medicare and don’t have any other additional insurance, you are responsible for paying your Part B deductible, and a 20% coinsurance for your appointments. Any other insurance you have. The facility that you seek care from. How much your individual doctor charges. Where you get your tests and services. Do not go into this treatment with no knowledge of the average estimate of payment. Talk to your doctor, and get all of your questions answered before committing to a certain recommendation they’ve made. If you should decide to seek the help of a professional acupuncturist, it is important to be quoted on prices for the entire process. Patients typically get the initial first visit cost and tend to forget any additional costs for follow up appointments or extra care. Find out how many appointments you’ll need to attend. If there are any additional costs, and how often you’ll need to attend follow-up visits. At this time, Medigap plans do not cover any costs that deal with acupuncture. While acupuncture is not covered by Medigap, chiropractic care is. In fact, Medigap Plan C and Plan F cover 100% of your Part B deductible, on top of your 20% coinsurance. If you combine your Medicare and Medigap plans, any medically necessary chiropractic work will be completely covered, at no cost to you. 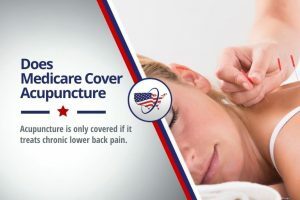 When it comes to Medicare Advantage plans, we hit a bit of a grey area with coverage for chiropractic care or acupuncture treatment. Each Medicare Advantage plan is different from the next. So one plan may offer high fees and fewer benefits, while another offers low fees and more benefits. At this point, it may be tough finding a Medicare Advantage provider that covers acupuncture. It may be worth looking into though if it is something you truly feel is a priority for your health. The same answer goes for chiropractic services. Although it is usually much easier to come across, the prices and plans will vary. At MedicareFAQ, we acknowledge that finding the right plan for you, with everything you are looking for, can be worrisome. But we are always here to help you find the best coverage for your medical needs. If you have any questions or concerns, we encourage you to contact us today. We can get you set up with a plan that best suits you, as soon as you are eligible for Medicare, or are preparing to enroll. To compare rates online now, click here.